Media fragmentation, accelerated product life cycles, widespread globalization and growing regulatory constraints are only some of the big challenges on the road to marketing success. Traditional marketing practices - carried out in business unit silos, on desktop productivity tools and without broad context - are just not measuring up. Smart marketers are taking advantage of Internet-based collaborative technologies and analytics to improve the efficiency and effectiveness of their marketing activities. 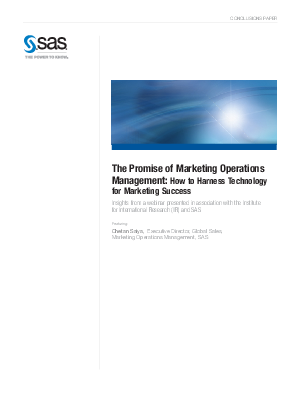 This paper presents technologies and recommendations for not only surviving, but thriving, as a marketer in a demanding and dynamic business climate.